The capital of Vinh Long province and plonked about midway between My Tho and Can Tho, Vinh Long may not be the largest town in the Mekong, but as a major transit hub it can be noisy and chaotic nonetheless. Flee the mayhem by heading to the riverfront, where plenty of cafes and restaurants afford respite. Despite a lack of in-town attractions, Vinh Long is the gateway to island life and some worthwhile sites, including Cai Be floating market, abundant orchards and rural homestays. What makes a trip to Vinh Long worthwhile is not the town but the beautiful islands dotting the river. The islands are dedicated to agriculture, especially the growing of tropical fruits, which are shipped to markets in HCMC. This low-lying region is as much water as land and houses are generally built on stilts. Some of the more popular islands to visit include Binh Hoa Phuoc and An Binh, but there are many others. You can take the public ferry to one of the islands and then walk or cycle around on your own. However, this isn’t as interesting as a boat tour, since you won’t cruise the narrow canals. You should be able to arrange a two- to three-hour cruise with one of the operators along the wharf for less than 300,000d. ( 5am-5pm) This bustling river market is worth including on a boat tour from Vinh Long, but aim for an early morning visit. Wholesalers on big boats moor here, each specialising in just a few types of fruit or vegetable, hanging samples of their goods from tall wooden poles. A notable sight is the huge and photogenic Catholic cathedral on the riverside. It takes about an hour to reach the market from Vinh Long, but most people make detours on the way there or back to see the canals or visit orchards. For those travelling on an organised tour of the delta, it is customary to board a boat here, explore the islands and moor in Vinh Long before continuing to Can Tho. (Phan Thanh Gian Temple; Ð Tran Phu; 5-11am & 1-7pm) Confucian temples such as this are rare in southern Vietnam. The front hall honours local hero Phan Thanh Gian, who led an uprising against the French colonists in 1930. When it became obvious that his revolt was doomed, Phan killed himself rather than be captured by the colonial army. The rear hall, built in 1866, has a portrait of Confucius above the altar. Sitting in pleasant grounds across from the river, Van Thanh Mieu Temple is southeast of town; designed in Confucian style, it looks like it was lifted straight out of China. Don’t confuse it with the smaller Quoc Cong Pagoda, which you’ll pass on the way. With a magnificent sense of seclusion, the four-star Mekong Riverside Resort & Spa ( 073-392 4466; www.mekongriversideresort.vn; Hoa Qui Ward, Hoa Khanh subdistrict, Cai Be district; lake/river view d US$85/110) has lovely thatched bungalows and stunning views across the vast river waters. Seize a fishing rod and angle for fish from your balcony or just sit back and watch the river boats cruise the Mekong at night. With free canoes, bird-watching tower and swimming pool, the resort offers the chance to fully experience the astonishing riverine world of the Mekong Delta. The resort can arrange transport. ( 070-382 3616; www.cuulongtourist.com; 2 Ɖ Phần B Chậu; 7am-5pm) Offers a variety of boat tours ranging from three hours to three days. Destinations include small canals, fruit orchards, brick kilns, a conical palm hat workshop and the Cai Be floating market. You’ll find much better accommodation in Ben Tre, Tra Vinh and Can Tho, and much more atmospheric accommodation in one of the local homestays. If you really must stay in Vinh Long town, the following are the best options. ( 070-382 3820; 4 Ð 1 Thang 5; r 300,000-400,000d) A small, tall and slim place with just five rooms, the bonus here is the location near the river. Rooms (one with balcony) are a good size, but shower rooms are tiny. ( 070-382 3656; www.cuulongtourist.com; 2 Ɖ Phan B Chau; s from 440,000d, d from 560,000d) This clean but characterless government-run hotel sees midrange tour groups checking in as the boats leave from directly across the road. Rooms are spacious and have baths, and either balconies or river views. For many travellers, the chance to experience river life and to share a home-cooked meal with a local family is a highlight of a Mekong visit. Perhaps ‘homestay’ is the wrong word: in most cases you won’t actually be staying in the family home but in specially constructed accommodation more akin to a rudimentary hostel. Some homestays have large communal rooms with bunks, while others offer basic bungalows with shared facilities and some even have rooms with en suites. Dinner and breakfast is usually included. In some places you’ll share a meal with the family, while in bigger places the experience is more like a restaurant. The only constant that you can be guaranteed is a verdant, rustic setting and a taste of rural life. Although many tourists book through group tours in Ho Chi Minh City, there’s no reason you can’t do it yourself – just take the ferry from Vinh Long and then a xe om (motorbike taxi) to your preferred choice. Note that some hosts are unlikely to speak much English, but welcome foreign guests just the same. Ba Linh ( 070-385 8683, mobile 0939 138 142; [email protected]; 95 An Thanh, An Binh; r 350,000d) Run by friendly Mr Truong, this traditional-looking and popular place has six simple, high-roofed, partitioned rooms in a line, all with fan. Breakfast and dinner is included in the price. 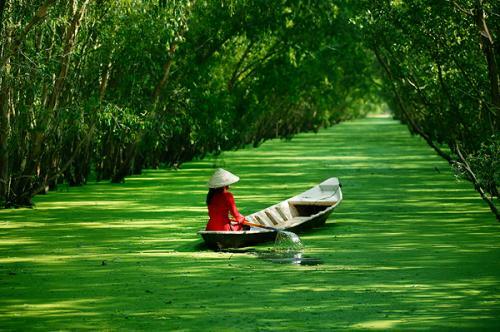 Ngoc Sang ( 070-385 8694; 95/8 Binh Luong, An Binh Village; per person US$15) Readers love this friendly, canal-facing homestay. The food is good, free bikes are available and you can even help out in the family’s orchard, if you feel so inclined. Ut Trinh ( 070-395 4255, mobile 0919 002 505; [email protected]; Hoa Qui, Hoa Ninh, An Binh; r US$15-25) Cordial owner Trinh speaks excellent English at this very pleasant, fresh and clean homestay with excellent rooms in two buildings on a veggie/fruit farm. Nam Thanh ( 070-385 8883; [email protected]; 172/9 Binh Luong, An Binh; from US$12) Four hundred metres from the jetty (the owner can pick you up), this friendly 26-bed camp-style homestay offers fold-up single beds in a communal space and sturdier doubles in rattan and bamboo quarters. (49 Ð 2 Thang 9; mains from 30,000d; 6am-6pm) Popular and spacious Dong Khanh (the name means ‘celebrate together’) offers a varied menu, including hotpots, pork noodles, roast chicken and Cantonese rice. English-language menu. (Ð 3 Thang 2) Great spot for local fruit and inexpensive street snacks. (Ð Phan B Chau; mains from 30,000d; 6am-10pm) Decent choice by the riverside, but it can fill up with tour groups. (Ð 1 Thang 5; iced coffee 7000d; 7am-11pm) Perched on the riverbank, this is a good place to enjoy an iced coffee or scented tea in the morning or to quaff your first beer back on dry land after a river trip. Cargo boats sometimes take passengers from Vinh Long all the way to Chau Doc (near the Cambodian border); enquire locally, near the ferry landing. Vinh Long’s city bus station (Ben Xe Thanh Pho Vinh Long; Ð 3 Thang 2), conveniently located in the middle of town, has buses to HCMC (90,000d) and Sa Dec (9000d). For other services you’re best to go to the provincial bus station (Hwy 1A), 3km south of town on the way to Can Tho. Buses to Can Tho (40,000d), HCMC (100,000d) and other destinations leave from here. A motorbike taxi will cost around 300,000d from the centre of town to the provincial bus station. Vinh Long is just off Hwy 1A, 33km from Can Tho, 66km from My Tho and 136km from HCMC.